Betting on the Kentucky Derby has most likely been around since the very first running of the race in 1875. Over the years, as with other aspects of the race, betting for it has evolved into a simple system that still manages to give gamblers a wide range of options when betting on the race. Today, it is easier than ever to place bets on the race online - and win big depending on the type of bet you place. There will be 20 horses in this year's race, meaning there are many different betting opportunities available. Doing research on horses and riders is advised for obvious reasons, but going with the contenders is not always advisable. No matter your betting strategy, there are rules you are going to have to follow as you place various types of bets. Keep reading to learn more. 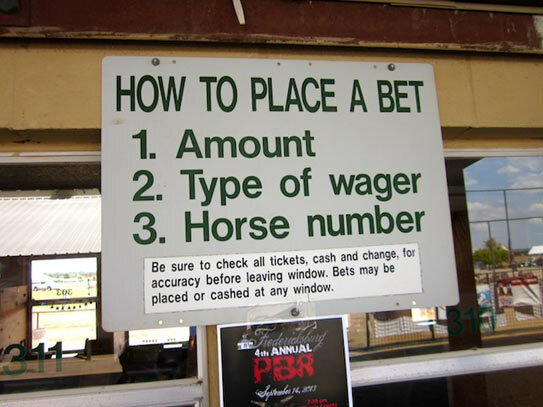 Depending on where and how you place your bets on the Kentucky Derby, the rules may vary a bit. Having said that, most times all bets must be made at least a few minutes before the race begins. This is why it's important to start doing your research about the 2018 Kentucky Derby now while you still have time. Knowing the specific rules for online betting on the Kentucky Derby is important, so choosing how you are going to place your bets is also something you should do as soon as possible. Win - This is a bet for a single horse to win. Place - This is a bet for a single horse to finish first or second. Show - A bet the horse will place in the top three. Across the Board (Win, Place & Show) - This is similar to a show bet, but if your horse wins second or first, the payout is much larger. 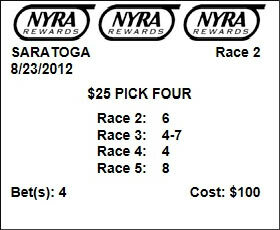 Exacta - This is a bet for the first and second places - in the exact order. 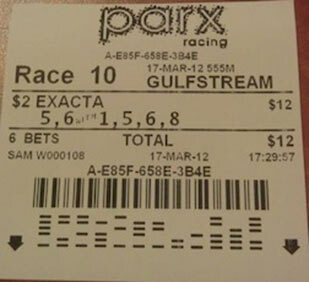 Exacta Box - This is like the exacta bet, except that the winners can be in any order. 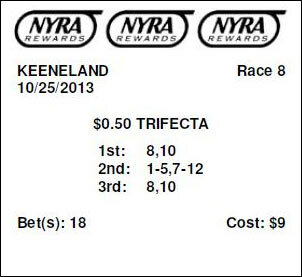 Trifecta - This bet is for the top three finishers in a specific order. Trifecta Box - Similar to the trifecta except the winners can be in any order. Superfecta - This is the toughest bet but one with the biggest payout. It chooses the top four finishers in exact order. 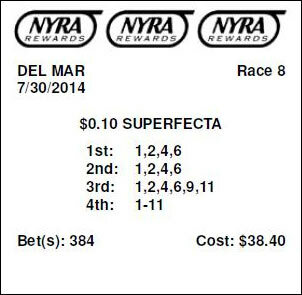 Superfecta Box - This is the same as a superfecta except the order of the top four horses picked does not matter. As you can see, there are quite a few options when it comes to horse races like the Kentucky Derby. Knowing the options and payouts is important for coming up with a good betting strategy to follow. If you are interested in placing some wagers online on Kentucky Derby 2018, Of course, the big payouts this year will be for exacta, trifecta and superfecta bets. With twenty horses in this year's race, there is a lot of data and information that should be gone through to see who the real 2018 Kentucky Derby contenders are going to be as the race grows closer. Also important is paying attention to the exact odds for the 2018 Kentucky Derby. Keeping an eye on this data as the race grows closer is important when deciding which horses to bet on before the big race. With no clear winner picked yet, there is a lot of opportunity to have fun and make some money at the same time. The Kentucky Derby is a lot of things to a lot of different people, but for those who like to wager, it is indeed two of the most exciting minutes in sports. The more research and thinking that is done before bets are made, the better chance of winning big. It's still a gamble, of course, but knowing about the horses and the riders can help give you an advantage when trying for an exacta, trifecta or superfecta bet on Kentucky Derby 2018. There's no question that horse racing is a complex sport and the betting component makes it even more so. It's not possible to provide a comprehensive introduction to the 'Kentucky Derby Betting' in a short document. Thousands of books have been written on the topic for all levels of experience on horse betting. There's plenty of resources for anyone that wants to learn more about race horses, tracks, training, breeding, handicapping and any other nuance of the sport. 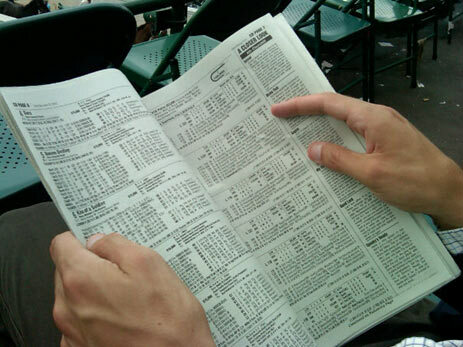 For the aspiring horse race bettor, however, the best place to start is to learn about the bets themselves for this Kentucky Derby. Betting on horse races such as 2018 Kentucky Derby can be very intimidating for the beginner with a myriad of numbers, odds and prices flashing on a board that provides information on multiple races and often from tracks all over the world. It may seem that everyone else at the track knows what they're doing which makes the experience even more daunting. But even the most knowledgeable horse handicapper had to start somewhere and there's a good chance they had the same foundation in the sport that you're about to receive—learning about the types of bets and how to place them. As noted above, the fundamentals of horse racing have changed very little since the 18th century. For that reason, it's helpful to understand a brief history of the three most significant developments in the growth of horse race betting in North America. The information that follows is not mere trivia—understanding how betting on horse races became standardized and modernized is important for learning how to bet successfully. All three of the following developments are still relevant today, and it's crucial to have an understanding of these concepts to provide context for betting and handicapping. The first one we'll cover is downright essential to successful horse race betting at any level of expertise. A good place for the beginning horse bettor to start is by understanding parimutuel wagering and how it differs from casino or sports betting. For an advanced player, knowledge of parimutuel wagering concepts is an essential component of their handicapping and betting decisions when you wager on Kentucky Derby horses. All horse racing tracks in North America operate under the parimutuel wagering system as do jai alai frontons. A Frenchman named Pierre Ollier receives credit for creating the system in the middle of the 19th century. A perfumer by trade, Ollier came up with the parimutuel concept as a reaction to losing too much of his money to Parisian bookmakers. The term 'parimutuel' loosely translates to “wagers among ourselves” (another theory suggests that it's simply a contraction of 'Paris' and 'mutuel') and essentially eliminates the ability of oddsmakers to determine how much a specific wager should pay. That's not always a good thing, but it is a reality that horseplayers must understand. Under the parimutuel system, all money wagered on an individual bet type is pooled and the proceeds divided equally among the winning bets placed on races like the Derby. Before winning bets get paid the track will deduct a 'house cut'—known to horse players as a 'takeout.' 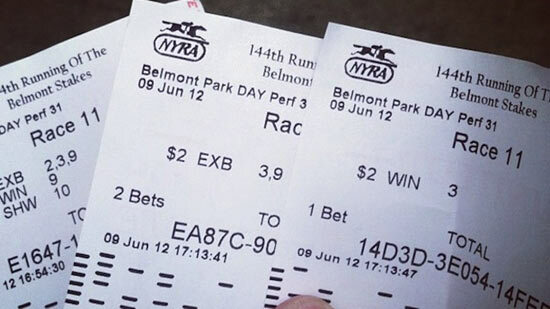 There is much debate among horseplayers, track owners and the racing media about the ideal amount for the 'takeout'. Currently, takeout percentages are usually between 15% and 25% though there is a growing call for lower takeout percentages. The desirability of lower takeouts is a logical idea as it means more money in the hands of horse bettors. Since they'll typically end up betting more with these additional funds, the money will still end up going to the track more often than not. In the process, however, the horse player will be able to make more bets and generally have a better experience at the track. The revenue generated from the 'takeout' goes to pay for a variety of functions. The state and local government will get a big share. The rest goes to purses for race winners along with track operating costs and overhead. Although horse bettors at Kentucky Derby loathe a high takeout, it is one of the reasons that horse racing has been able to survive and thrive throughout the 20th century when governments would prohibit other forms of gambling. The state and local government were able to get their 'cut' in a bulk disbursement with full transparency. The dictates of the parimutuel system made it difficult for track employees to 'skim' or otherwise deny government their 'pound of flesh'. There's one more way that the government regulators wring money out of the bettors—payouts on winning tickets are rounded down to an even increment (usually 10 or 20 cents). For example, a win of $33.56 would be rounded down to $33.50 (10 cents) or $33.40 (20 cents). This practice is called the 'breakage' and is a relic from an era when it was simply easier to calculate payouts this way. Obviously, there's no excuse now, but it continues as another small excise on bettors but one that adds up quickly. As we eluded to above, the parimutuel system has its upsides and downsides. One of the biggest liabilities for horseplayers is the reduction of big payout longshots. Simply put, if a lot of people bet on Kentucky Derby or any race longshot at the horse track, it ceases to be a longshot. At the sportsbook, if you bet on a team at 99/1 to win the Super Bowl, you'll be paid at 99/1 should it transpire. The bookmaker may subsequently move the line to reflect team performance and betting patterns, but as long as you've got the 99/1 ticket in your pocket the sportsbook will pay a winning ticket at that price. At the 2018 Kentucky Derby horse track, your payout on a longshot depends on what happens at the betting window up until race time. If your longshot gets additional support from horse bettors you'll be paid at lower odds than you bet should he win. If you're the only one that has any enthusiasm for a horse, and he goes on to receive little betting interest you could be paid at a higher price than you originally bet. You'll often see sportsbooks offer futures and moneyline wagers on the big horse racing events like the Kentucky Derby and Breeders' Cup. In this instance, they'll book the race the same way they would any other sporting event. This circumstance not withstanding, when you bet on Kentucky Derby horse race you'll be doing so under the parimutuel system. Simply put, the 'takeout' is the 'house advantage' that a winning horseplayer has to overcome if he is to be profitable in the long term. Most people are familiar with the concept of 'vig' or 'vigorish' in sports betting. A player in the sports book has to lay 11 to 10 for most straight bets. The extra 10% assessment on losing bets is where the 'house' makes its money. It also means that to be profitable as a sports bettor you have to do better than 50% winning plays. At 11/10, a player has to hit approximately 53% winners to make money. In horse racing, you've got to win enough to overcome the takeout to make money in the long term. It's a significant challenge, but it is possible. In fact, many advanced betting concepts are designed to minimize the impact of the takeout. As a beginning player, you should just focus on making good Kentucky Derby bets, but the takeout percentage is still important to keep in mind. It's why it's seldom a good idea to try to back the favorite race after race. You'll do better hitting fewer winners at higher prices. 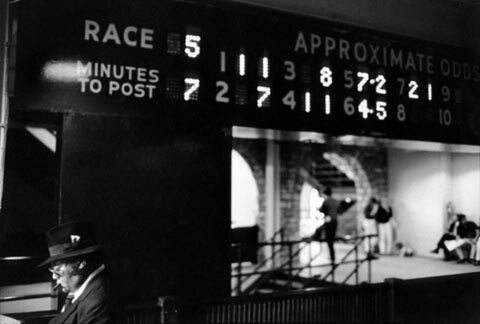 The tote board at the racetrack might not seem like much in the digital era but its development in the early part of the 20th century revolutionized horse racing. Additionally, the tote board is credited for at least some of the sport's public popularity and relative acceptance by government and community leaders. Before the advent of the tote board, the calculations of winning horse bets required manual computation and that could be a time-consuming process. George Julius, an Australian engineer, developed the first all mechanical tote board in the early 1900s with the first unit installed at Ellerslie Racecourse in New Zealand in 1913. It would be a couple of decades before the first tote boards came to the United States, first at Hialeah Park, Florida (1932) and Arlington Park outside of Chicago (1933). 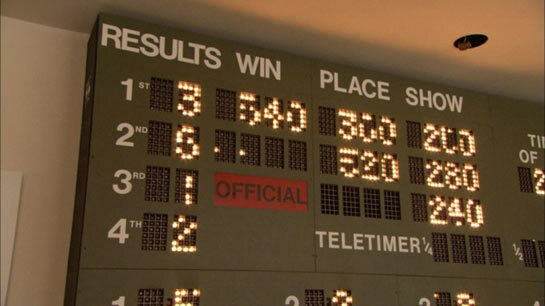 By the late 1960's, the mechanical tote boards started to be replaced by electronic tote boards. 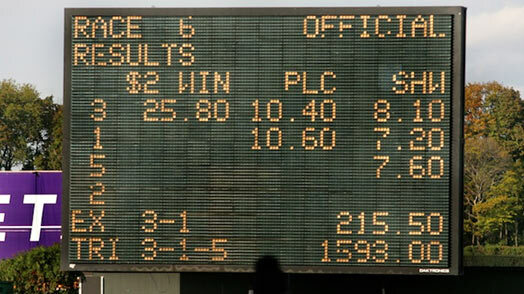 Today, virtually all tote boards have been replaced by computers running specialized wagering software displayed on LED screens. Despite the seismic changes in technology during the past few decades the term 'tote board' remains in common usage. When tote boards first started to become popular it allowed the advocates of horse racing to make a new argument to counter concerns of corruption by civic and religious leaders. The tote board put the 'business' of bookmaking on full display for the public to see. The prevailing argument became that horse racing and parimutuel wagering were less 'evil' than traditional bookmaking. This position may be of dubious logic to say the least, but it was surprisingly effective in helping horse racing gain traction across North America during the 20th century. 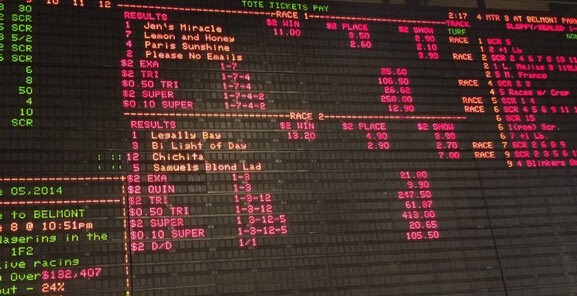 The tote board is still the primary data center for the horse racing enthusiast. 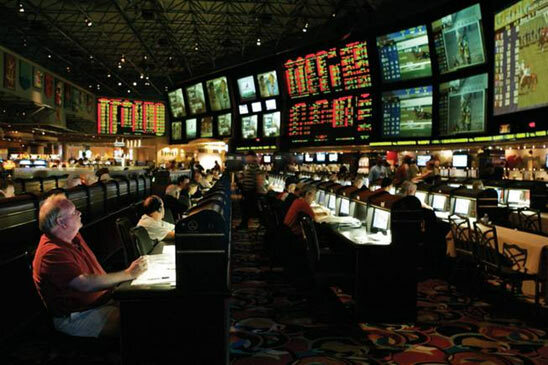 It doesn't matter whether it's on your computer screen or a big LED display at the racetrack—it provides real-time, running data on how the public is betting and how it's impacting the odds. You'll find potential payout odds; will pays for open exotic wagers and other critical information. To be sure, there are plenty of other sources of horse racing and handicapping data today, but the tote board remains the focal point of the horse racing experience. It also allows more experienced players to 'time' their wagers, often betting at the last minute to obtain more favorable odds. Get used to watching the tote board and learn how to 'read' it to understand betting patterns—it doesn't take long until you'll be able to find betting opportunities this way. This format quickly becomes second nature but until it does don't make the 'rookie mistake' of using the horse name instead of the number. It helps to write down your wager before you head to the window. The ticket writer will usually call the bet back to you as he's printing your tickets to verify that he heard it correctly. Once you get your tickets, quickly look at them to make sure everything is right. If you catch a mistake at the window, it can be corrected. Obviously once you've left the betting station the bet is valid and can't be changed Count your change at the window for the same reason. And tip your ticket writer, especially if you hit a big score. Trust me, it'll pay dividends down the road. Another good habit to develop is checking your losing tickets after the race to make sure they're actually 'losers'. This won't be an issue if you're betting online at 2018 Kentucky Derby since they'll end up credited to your account but you'd be surprised how often you'll mistakenly think a winning ticket is actually a loss (and vice versa). You'll also encounter situations where a horse that finish ahead of the one you bet is disqualified after a steward's inquiry. There's no worse feeling than for a loser to become a winner and your tickets are already in the trash can. If you bet online on Derby (or with any other type of automated interface), you'll need the same information, but you'll have to do the work yourself. The organization of online horse betting sites is usually in the same order as above—track name first, then race number. Typically, you'll be presented with a variety of betting options for each race on one screen. This interface is where you'll enter the dollar amount, the type of bet and the horse number. You'll be shown a 'confirmation screen' before your bet is made official—double check the information and then submit your wager. If you vary your bet amounts it is especially important to verify the dollar amount wagered—betting software will often 'default' to your most frequently bet dollar amount. Note that the information above is for any straight bet (win, place or show). Calling out and betting exotics is somewhat different and we'll discuss that when we cover this type of wager. Kentucky Derby bets are usually divided into two categories—straight bets and exotic bets. Straight bets are the best place to start your betting career but you'll quickly graduate into exotic bets. As the name implies, straight bets involve wagers on a single horse in a single race to either win or finish near the front of the field. Exotic bets involve either multiple horses in a single race or one or more horses in multiple races. During the 1950's, straight bets represented 95% or more of the money wagered in a typical day at the track. 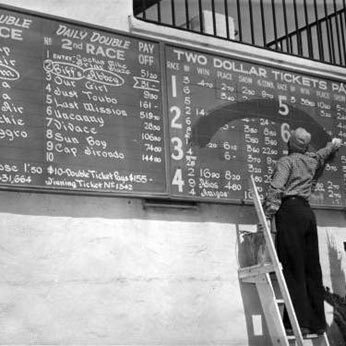 The only other wager was the 'daily double' in which bettors would pick the winners of the first two races on the card. Today, straight bets represent only 35% or so of the overall betting handle. Let's say horse #5 goes off at 3/1 odds. You'll receive $8 when you cash your ticket--$6 for your successful 3/1 wager and your original $2 stake. In the 'real world' this would be minus 'takeout' and 'breakage' but for the purpose of explaining these bets we'll pretend that these assessments don't exist. 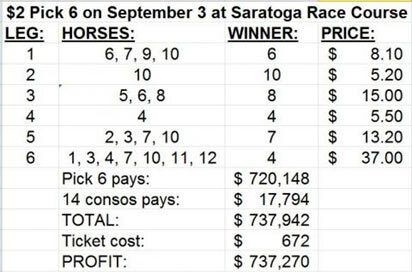 In the 'real world' the payout odds would be figured by taking the total amount wagered on all horses 'to win' (known as the 'win pool') and subtracting the takeout. That amount is then divided by the amount wagered on each horse to determine actual payouts. It's important to remember that the Kentucky Derby betting odds do not represent the chances of a specific interest winning a race. Instead, the odds are indicative of a horse's payout ratio for a specific bet which is a function of the financial support they're receiving from the betting marketplace. The fundamental challenge of handicapping is to find situations where a horse's chance of winning is greater than the betting odds represent. This is called an 'overlay' and is the goal of every successful handicapper. The opposite of an 'overlay' is an 'underlay'--an underlay occurs when the betting odds represent that a horse has a greater chance of winning than he actually does. How do you figure out the horse's chance of winning? That's the hard part. These concepts apply to sports betting moneylines and point spreads as well. Another point worth mentioning here—North American tracks quote odds as fractions but tracks in the rest of the world usually quote them as decimals. A track in Australia or Hong Kong would quote the above example of 3/1 odds as 4.00. Simply multiply your stake (2$) by the odds (4.00) and you'll get the same payout ($8.00). The good news is that if you're betting international races online you'll be offered the option of how you want odds displayed. Just select 'fractional' odds and you won't have to worry about decimals. So our profit on this bet is .66 cents and you should be starting to see why it's hard to make money betting big favorites at The Derby. When you factor in the takeout and breakage you're either making a minuscule profit of a few cents or even losing money. You'll sometimes see favorites priced at 1/5 or less (.20) but most tracks have a minimum payout—a bet on a horse priced at shorter odds will be paid out at 1/5 or .20. For a $2.00 minimum wager this represents a minimum payout of $2.40. American Pharoah won the race and cashed all three straight bet types (win, place and show). 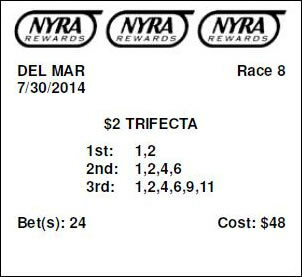 $2 bettors on the eventual Triple Crown winner were paid off as indicated. Firing Line finished second and cashed place and show bets. Dortmund finished third and paid $4.20 to show. In most cases, the price 'to show' will be less than the price 'to win'. The price to 'place' will be less than both other bets. There are exceptions and the 2015 Kentucky Derby was one of them. American Pharoah went off as a 5-2 favorite while Firing Line was 9-1. The disparity between these odds is why Firing Line paid more 'to show' than American Pharoah did 'to win'. Keep in mind that these payouts are figured based on the amount of money in the 'pool' for each bet minus the track takeout. Takeout at Churchill Downs is 17.5% for straight bets and 22% for exotics. Then divide that figure by the number of $2 bets on your horse. Add $2 to that result and you've got your estimated place payout. Figuring a 'show' payout is done exactly the same way with two minor adjustments. In the second step, you'll subtract the amount of money wagered on your horse and the two horses with the highest amount of 'show' money bets to determine the 'show pool profit'. In the third step, you'll divide the 'show' pool profit by three (for the three horses cashing a ticket). There are a number of ways to use these calculations for handicapping. In fact, the Kentucky Derby is a perfect example of one—you'd might have determined that betting American Pharoah to 'place' at 5.80 would be more of an overlay than a bet to 'win' at 7.80. As noted at the outset of this section you're well advised to use the many technological resources to figure out potential payouts but it's crucial to understand what it all means. At the outset of our discussion on horse race betting we observed that 'at it's essence the sport has changed little since the 19th century'. Exotic bets are the exception to that rule and are a relatively modern addition to the horse racing menu. A horse player in the 1950's would have had only one choice for an exotic wager—the daily double, where he would try and select the winner of the first two races on the card. This was considered a 'novelty bet' and the province of amateurs and recreational players. 9.50 out of every 10 dollars wagered was on one of the three straight bets (win, place or show). That has changed dramatically to the point that today exotic wagers comprise around 70 to 75 percent of the horse racing handle. One reason for the explosion in exotic wager options is competition. Throughout most of the 20th century, there were few gambling options to challenge the dominance of horse racing. Florida had a few jai alai frontons, Nevada had casino gambling and there were plenty of illegal bookmakers throughout the country. But as far as legal betting options were concerned, horse racing was just about the only game in town. When the legal gambling market started to expand players not only had options for where to spend their betting dollars but a variety of new wagering opportunities that offered big payouts for small investments. 'Betting a little to win a lot' became the gambling strategy of choice for the mainstream masses. They flocked to sports betting parlay cards, networked progressive slot jackpots like Megabucks and big dollar, multi-state lotteries such as Powerball. These types of games were popular with both players and 'the house'--they typically offered game operators a higher 'hold' percentage overall even with the payout of a huge jackpot. The popularity and high hold percentage of big jackpot bets was not lost on horse racing who had a perfect product for this type of wagering. There was also plenty of precedent as what would become known as 'exotic wagers' had long been popular internationally. As the years progressed, the sport would continue to add new bet types with longer odds and bigger payouts to keep up with the massive expansion of other forms of gambling in the North American market. At this point, you're probably thinking that exotic Kentucky Derby bets sound a lot like sports betting parlays. This is a very good comparison—in both cases, a player must successfully pick more than one outcome to cash a ticket. The more correct outcomes offered in a specific bet means longer odds but a larger payout for the successful handicapper. One substantial difference between Derby exotic bets and sports parlays: sports betting parlays are usually considered to be a favorite wager of 'squares' and recreational players. That's not the case in horse racing where many high level handicappers specialize in trying to find value in exotic bets. There are two types of exotic bets in horse racing determined by the number of horses and/or races a player must successfully select. A vertical bet (eg: exacta or trifecta) requires the bettor to pick the top finishers in a specific race in the correct order. A horizontal bet requires the player to pick the winner of a set number of races. The daily double is a horizontal bet but bets involving as many as six or seven races are common today. Occasionally, you'll come across one of the new forms of exotic wagering that are essentially a hybrid of the two and require a player to select multiple horses in multiple races. One more thing worth mentioning—the terms we'll use to discuss the bet types below are the ones most commonly used in the United States. Many of these bets are known by other names in various parts of the world. 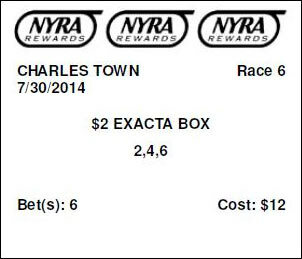 For example, in certain parts of Canada what is known as an 'exacta' to American bettors is known as an 'exactor'. If you're betting races at an international track it's a good idea to learn the local betting lexicon as there might be differences from what you're used to. The expert strategy for exactas and other types of exotic bets is to make multiple wagers to 'cover' different results. Using the example above, lets say you like horses #8, #3 and #6 but are unsure about their order of finish. One strategy in this situation is to bet every permutation of all three horses in the win and place spot. This is called a box and the term is common to all exotic wagers. Keep in mind that to cover all possible win/place scenarios with these three horses you're making a total of 6 bets at a total cost of $12. This is why it's crucial to estimate the payouts before playing your bet on Kentucky Derby—you don't want to spend more on your bet than you can possibly win which is possible if you include a big enough favorite. You'll find a wide selection of calculators, computer software and smartphone apps to help calculate exotic bet ticket prices and payouts. A couple of other horse racing terms that you'll hear a lot at Kentucky Derby are: the #8 horse in this bet (eg: the horse that you're picking to win and using in all of the exacta bets) is called the 'key horse'. This would result in four bets for a total of $8. 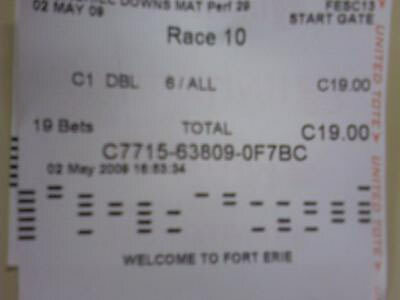 In the 2015 Kentucky Derby the winning 18/10 exacta payed $72.60. The quinella is similar to the exacta in that the player must select the first and second place finisher in a race. The difference is that the order of finish doesn't matter. You won't find quinella betting at every race track. This is due to a conventional wisdom among horse track executives that quinella pools come at the expense of exacta pools. At least this is their rationalization—a more cynical possibility is that they simply don't want to offer what is considered a very player friendly bet. If you have the option to bet both the exacta and quinella you'll have to determine which bet is more advantageous. For example, a quinella bet would likely be the best choice if you're betting two horses with similar, fairly short odds at the Derby. The exacta (and more specifically an exacta box) would be a preferable option if one of the horses you like is a good sized long shot. A 3 horse box will give you six separate bets for a total of $6.00. A 4 horse box would have 24 combinations and cost $24. You can see how quickly your bet cost can go up with every horse you try to 'cover'. In either scenario, the size of the field will determine how many combinations you bet. A 7 horse field would produce 30 combinations, an 8 horse field would produce 52 combinations and so on. At the 2015 Kentucky Derby the winning .50 cent trifecta of 18/10/8 paid $50.50. You can key, wheel or box horses as above but be careful—with four spots every horse you add to the mix causes your bet price in increase significantly. At the 2015 Kentucky Derby the winning 18/10/8/15 Superfecta paid $634.10. 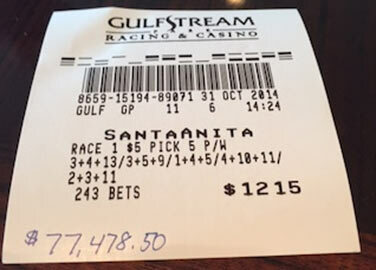 A recent addition to the Kentucky Derby betting boards was first introduced at Santa Anita. The Super High Five requires the player to select the top five finishers in correct order. The conventions of the bet are the same as above, only with five horses. The 2015 Kentucky Derby Super High Five winning ticket of 18-10-8-15-5 paid $6,658.30 for a $1 bet. The second type of exotic wager is the horizontal bet which requires the bettor to pick the winner of multiple races. We'll group these together as they share common characteristics with the only difference being the number of races involved. In this example we're betting horses #8 and #6 to win the first race and #1 and #4 to win the second race. You'll end up with four wagers for a total of $8. The 2015 Kentucky Derby daily double was paired with the race immediately before the 'Run For The Roses', the Grade 1 Woodford Reserve Turf. A 5-18 winning ticket paid $21.20 for a $1 bet. There was also a bet doubling the result of Friday's Kentucky Oaks race for three year old fillies with the Kentucky Derby. 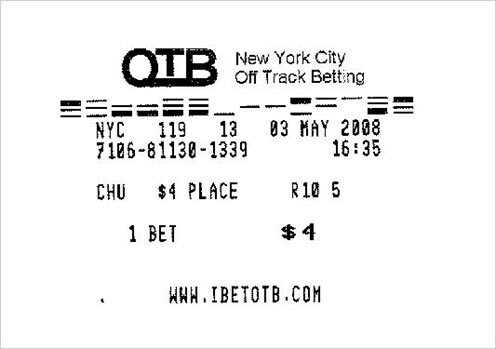 The winning 7-18 ticket in the Oaks/Derby Double paid $27.30. In this example you're betting on all combinations of #7 and #9 to win the first race, #1 and #4 to win the second and #4 and #6 to win the third. This will produce a total of 8 bets costing $8. 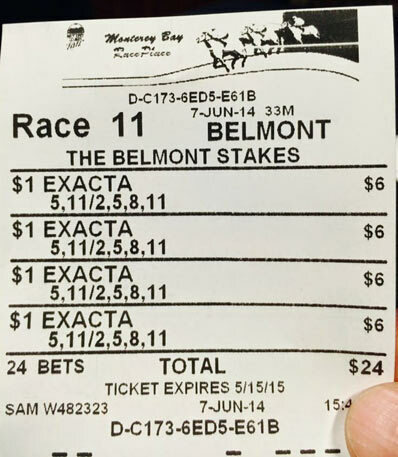 The 2015 Kentucky Derby had a .50 cent pick three that paid $52.18 for a winning 4-5-18 ticket. In this example you're betting on all combinations of #7 and #9 to win the first race, singling #2 in the second race, betting #1 and #4 to win the third and #4 and #6 to win the fourth. This will produce a total of 8 bets costing $8. 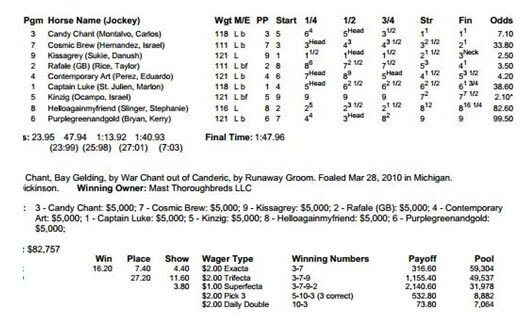 If you had added a second horse in race #2 it would have produced sixteen bets for a total of $16.00. If you play a lot of exotic wagers it's a good idea to download one of the many specialized bet calculator apps for Apple and Android smart phones. 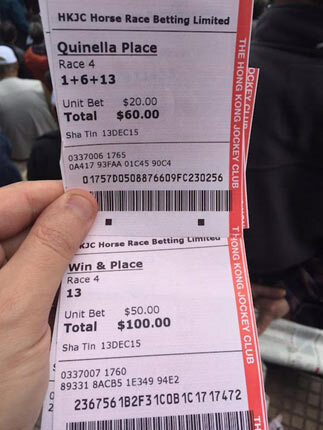 The 2015 Kentucky Derby had a .50 cent Pick 4 that paid $527.45 for a winning 3-4-5-18 ticket. In this example you're betting on all combinations of #7 and #9 to win the first race, singling #2 in the second race, betting #1 and #4 to win the third. betting #4 and #6 to win the fourth and betting #3,#5 and #6 to win the fifth. This will produce a total of 24 bets costing $24. 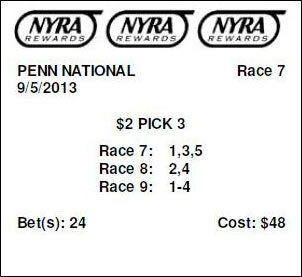 If you had added a second horse in race #2 it would have produced 48 bets for a total of $48.00. You can see how quickly the cost of a bet can increase just by adding one more horse. If you wanted to bet three horses in all five races you'd have 243 bets for a total of $243! The 2015 Kentucky Derby had a .50 cent Pick 5 that paid $2,452.90 for a winning 3-3-4-5-18 ticket. In this example you're betting on all combinations of #7 and #9 to win the first race, singling #2 in the second race, betting #1 and #4 to win the third. betting #4 and #6 to win the fourth, betting #3,#5 and #6 to win the fifth and singling #5 in the sixth race. Since we're singling horses in two of the six races it creates 24 separate bets for a reasonable cost of $48. If you bet 2 horses per race, however, you're looking at 64 separate tickets for $128. There are a couple of differences between the Pick 6 and the previous horizontal exotics we've discussed. The first is the 'carryover'. If a Pick 6 bet is not hit on one day of racing the prize pool is rolled over to the next day providing an even bigger pot. Additionally, this bet has a 'consolation prize' for hitting five of six. The 2015 Kentucky Derby had a $2 Pick 6 that paid $64,925.60 for a winning 11-3-3-4-5-18 ticket. 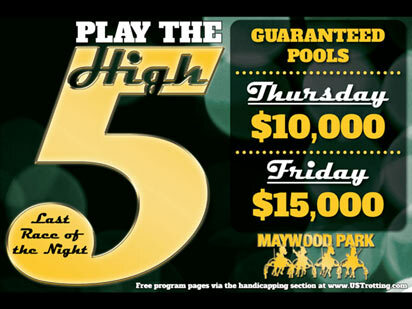 Bettors that hit five of six received a 'consolation' payout of $561.20. Found at the major California tracks, this $1 bet requires the horseplayer to pick a horse to finish first or second in every race on the card. The number of races on a card varies—for example, at Del Mar it's 8,9 or 10 races. There's no carryover provision so if there's no winning tickets the jackpot will be paid to the ticket with the most correct entries. Many bettors feel confident using the automatic betting machines (self-service) or mobile apps to place their bets. If you need some advice about placing a bet, the teller window at Churchill Downs is the perfect place to get some quick guidance. With your money in your hand, tell the teller which race you would like to bet on (there are up to 12 in one day), the amount you would like to bet on each horse, what position you want the horse to win in, and the horse’s number. Keep in mind that the teller will need to know if you are betting on a race at Churchill Downs even if you are physically standing in Churchill Downs. The reason for this is due to the fact that you can bet on a horse race anywhere in America from Churchill Downs. When you win, you can pick up your winnings from the teller, and if they gave good advice, it is the tradition at many racetracks to give the lucky teller a “tip” or gift of thanks. For gift advice, look behind the wall of the teller at their gift display. Before the Road to the Kentucky Derby system based on points was introduced, the call from Churchill Downs to participate in the race was determined by the earnings. For example, winning first place at a graded stakes race will make the overall pre-Derby purse earnings higher than a horse that only places third-place most of the time. With the new Kentucky Derby points system that was introduced in 2012 and implemented for the 2013 Kentucky Derby, bettors gained several advantages. For example, assigning races with different numbers of points gives bettors more chances to see Kentucky Derby contenders racing together before the actual race. The horses are also more likely to have previously raced on a dirt track similar to the one at Churchill Downs. There are 36 races altogether, and this was pared down from 180 graded stakes races. Each year, horses have a chance to win a certain number of points based on where they finished in the specific races designated by Churchill Downs. The top 20 horses with the most points from those 36 races are eligible for the Kentucky Derby. Ultimately, the system was invented to help amateur bettors feel more confident in participating in betting at the Kentucky Derby, and online betting for Churchill Downs races has become more popular in recent years. Congratulations—you now know how to bet on Kentucky Derby! If you're ready to learn more the logical next step would be to learn to handicap the races. Start by learning the differences between the various horse tracks in North America and the different surfaces at these tracks. You can then move on to handicapping the horses which will necessitate learning how to read the Daily Racing Form and understanding past performance charts. By now you should understand why horse racing is such a fascinating and challenging activity. No one can every 'know it all' and after you learn the basics there are countless directions in which to focus your study. You can focus on trainers, jockeys, breeding, pedigree, past performance, dosage and speed figures or any number of other factors. On the other hand, if you just want some action you can just bet based on a horse's name, the color of his silks, or his post position number. Either way, you'll have a lot of fun and with the information we've given you'll know how to place any Kentucky Derby bet on the board on May 5, 2018! This Kentucky Derby Betting guide was written by DerbyCraze.com and earned a 4.5/5 rating.